On this day 1988, a crowd of 15,000 Estonians gathered at the Old Town Festival in Tartu spontaneously began singing their unofficial national anthem – a song which, under the Soviet yoke, they were forbidden to sing. The crowd then marched from the town square to the traditional song festival site at the Tallinn Festival Ground, and carried on singing long into the night. By word of mouth, the same thing happened the next night – and then every night for the next week. Crowds of up to 100,000 gathered to sing until dawn folk songs about the land that they loved. One night, a drummer from a rock band rode around on his motorbike holding high the Estonian flag – a sight anyone under the age of fifty would never have seen in public. Suddenly thousands of participants were unfurling national flags they’d been forced to keep hidden since the Soviet occupation began in 1944 – and the streets came alive with the blue, black and white colours of Estonia. Bloody revolutions happened all over the world in the last half of the 20th century. But today we are celebrating the so-called Singing Revolution – an extraordinary three-year movement of non-violent resistance that was a crucial seedbed for the final dissolution of the mighty Soviet Union. Conquered repeatedly throughout history by Swedes, Danes, Germans and Russians, Estonia suffered particularly egregiously during World War II when the tiny but strategically placed Baltic state became a victim of the notorious Molotov-Ribbentrop pact. Occupied first by the Soviet Union, then Nazi Germany and then again by the Soviets, between 1940 and 1946 nearly 25% of Estonia’s population was annihilated, imprisoned, deported or managed to escape. After the war, the Baltic states were the only occupied countries whose independence was not restored. Latvia, Lithuania and Estonia sank deep and defenseless into the iron-fisted grip of Soviet rule. Throughout the subsequent near 50-year Soviet occupation, Estonia’s national identity was entirely suppressed. Russian became the country’s official language, it was illegal to own an Estonian flag, resistors were sent to Siberia and all national customs and traditions were effectively eradicated. But the Soviets made one oversight. They allowed the music-loving Estonians to maintain the tradition of their much-loved song festival, Laulupidu. In 1947, a song written from the lyrics of a traditional Estonian poem – “Land of My Fathers, Land That I Love” – somehow escaped Soviet censorship and was performed at the first post-war Laulupidu. The song was immediately banned, but it found its way into the consciousness of the people. “Land of My Fathers, Land That I Love” became the secret link to Estonia’s national heritage and a symbol of hope for the restoration of independence. When Mikhail Gorbachev came to power in 1985, it wasn’t long before Estonians seized upon glasnost’s promise of free speech. 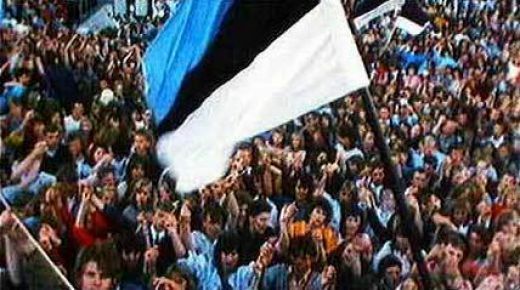 Environmental protests were staged, activists dared to speak out publicly against the communist regime and the Estonian flag began to tentatively re-emerge by flying individual blue, black and white banners side by side. And at the heart of the insurgence was the singing. In September 1988, 300,000 attended the Song of Estonia Festival. A quarter of the population sang for Estonia and its independence. Emboldened by their growing numbers, Estonians literally joined hands with separatist movements in Latvia and Lithuania. On August 23rd, 1989 – the 50th anniversary of the notorious pact between Hitler and Stalin that had sealed their fate – the people of Latvia, Lithuania and Estonia held hands to form “the Baltic Way,” a human chain that stretched 360 miles from Tallinn to Vilnius in Lithuania. A Tiananmen Square-type bloodbath was feared, but the people stood firm and kept singing. Gorbechev’s liberal reforms rendered the Soviets powerless against the non-violent actions until the attempted coup d’état against him on 19th August 1991. The very next day, Moscow’s troops and tanks arrived in Estonia to re-establish Soviet authority. But the Estonians formed human shields against the might of the Red Army. As news of the coup’s failure emerged, Estonia declared its independence on the night of 20th August 1991. Four months later, the Soviet Union was history. The revolutionary songs of the Estonians anchored their struggle for freedom, which was ultimately gained without the loss of a single life. For nearly half a century, it appeared that their nation might vanish completely; yet the Estonians waited, fought, sang and survived. Theirs is an inspiring, heroic tale – and a cautionary one: yes, we must tread carefully between patriotism and jingoism, between national pride and nationalism – but there is the risk of suppressing even the healthy, natural expressions of identity, pride and culture until they are merely distant memories.